Coming home after back-to-back trips — the first one the longest vacation I’ve taken in years — gives me a fresh look at my surroundings. Sam’s condo has always been much neater than my house was when I was downsizing. I knew my piles of reading material were accumulating, but living here every day, I didn’t quite notice how much. It’s not just what I’m currently reading or even what I’m planning to read, I’m holding on to what I’ve already read and “might want to see again”. Here’s a sampling from the stack in the corner…How old are some of these magazines? *Blush* — um, decades. First — Smithsonian, 1982. 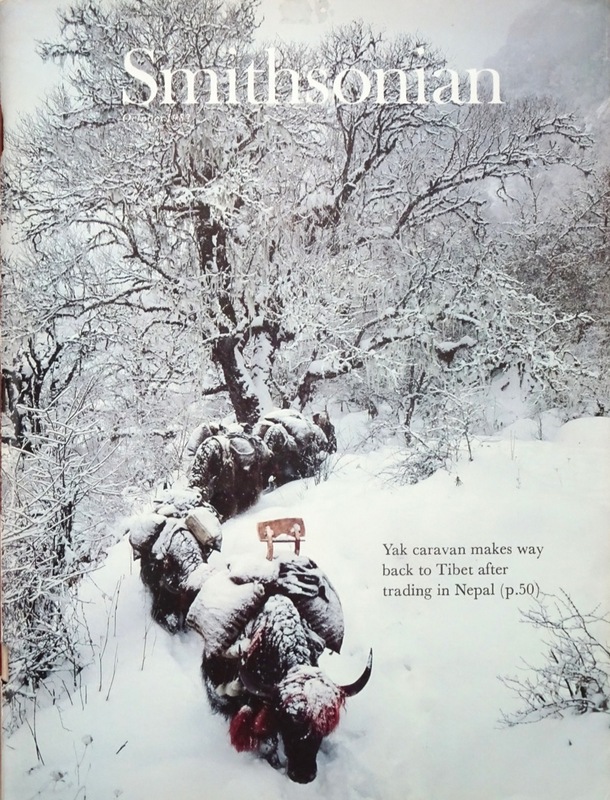 “Yak caravan makes way back to Tibet after trading in Nepal.” I couldn’t possibly let this go, could I? Because: yaks! I’m focusing on magazines. For books I (maybe) have better excuses. Some of these magazines are here because I found them in storage, brought them back to sort out and still haven’t let go; some are recently accumulated. Annals of Improbable Research, 1996. Bob used to take this magazine, and I found several in the basement. 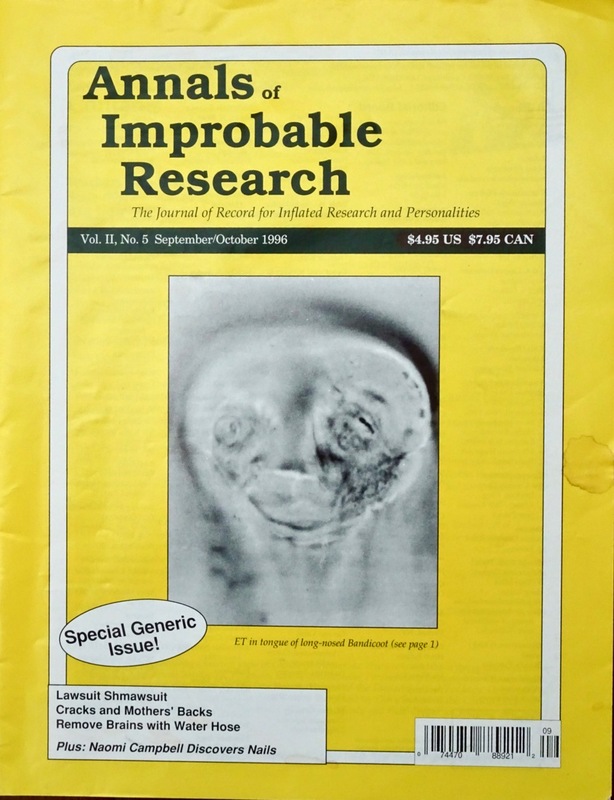 More on Improbable Research: In case you didn’t notice, this issue’s cover photo features seeing an image of ET in a “ventral view of Capillaria (Nematoda: Trichinelloidea) from the epithelium of the tongue of a long nosed bandicoot” from New South Wales, Australia. 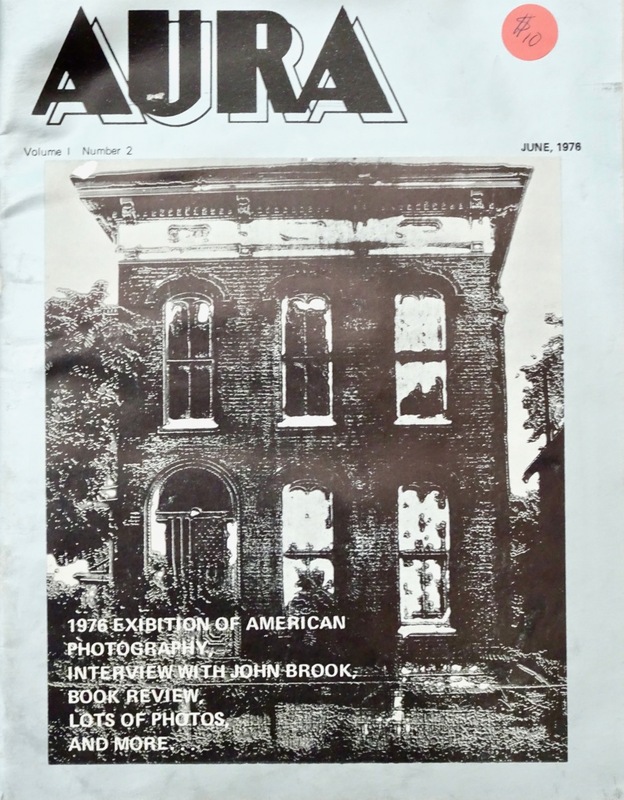 Aura Publications, 1976. This is the oldest one in the stack and here’s a mystery. I remember having a photograph accepted in an exhibition called Aura, but that would have been a decade later. I wasn’t taking photography classes yet in 1976. I have a list of publications somewhere; I’ll check that out next time it surfaces. 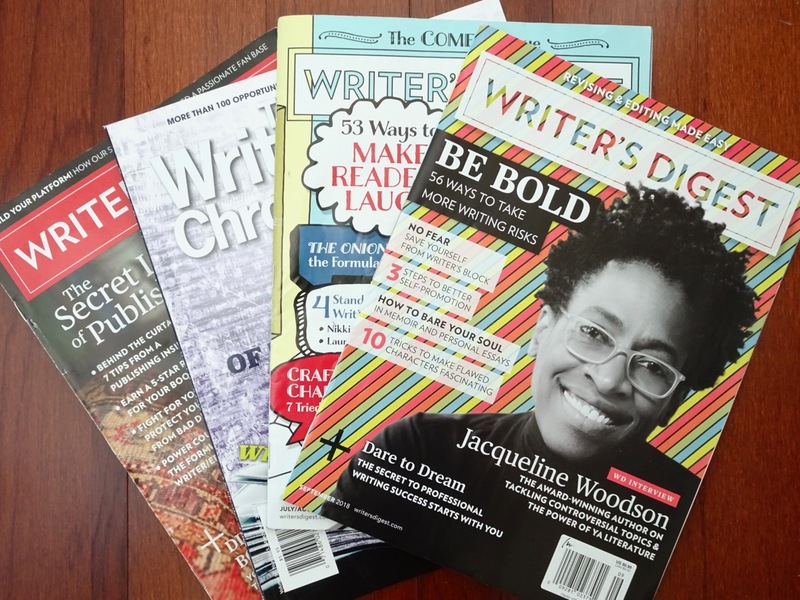 Writer’s magazines – at last, something contemporary. I’ve kept these to refer to, but shouldn’t I move on? 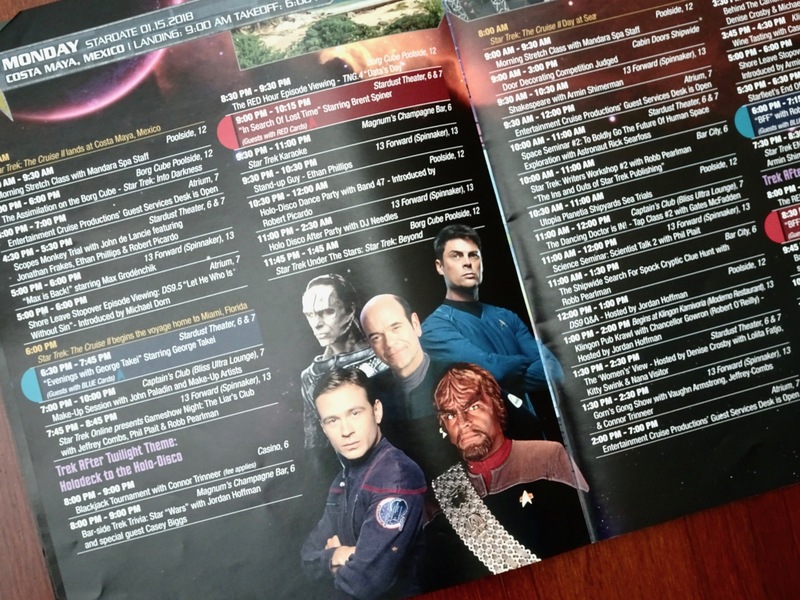 Star Trek cruise activity schedule, 2018. Technically not a magazine, but it insinuated itself into the stack. I kept it after our January vacation because I wanted to research a couple of the space and science presentations. Time to scan it if I think I still need to, and let this one go. See? Worf is glowering at me for keeping it all these months. 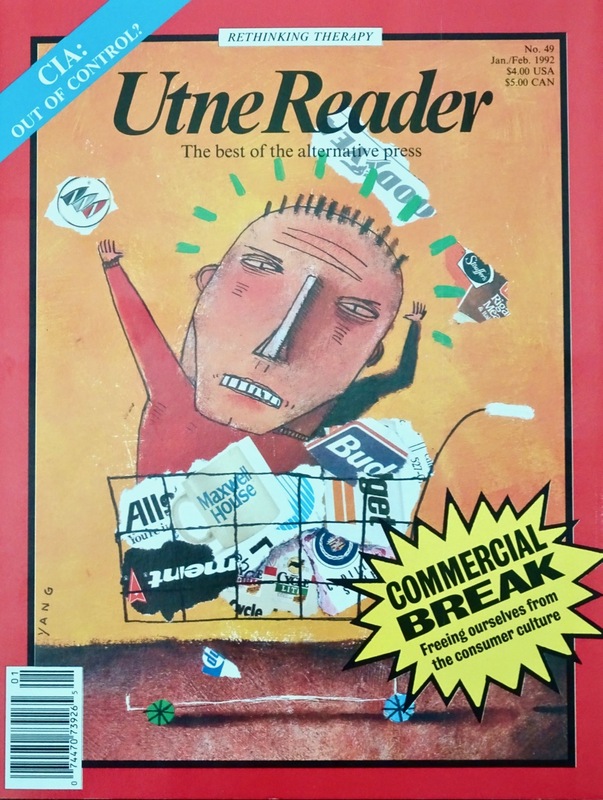 I also have clipped-out articles for how to do something, magazines with great photos, and other quirky things of interest — special thanks here to Bob’s 1980-90s stash of Smithsonians. I’ve tried online subscriptions, with the result that I never got around to reading the issues. Apparently I need a real presence to pay attention. Last year I asked the library about donating subscriptions, then going there to read the magazines. Apparently that’s complicated, and I was not met with enthusiasm. 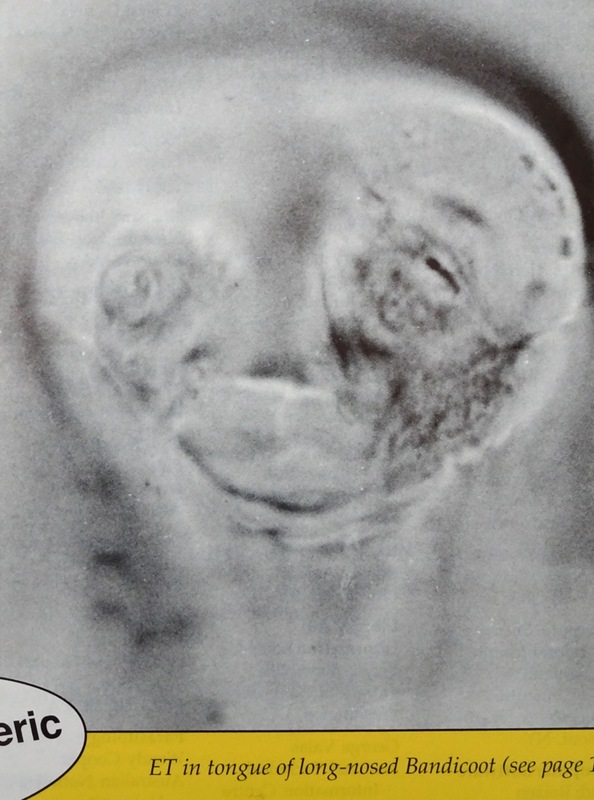 I could do a massive scan project, or maybe I just need to realize I can’t keep everything that interests me, and move on. Are you a keeper of magazines, and if so, how do you rein yourself in? This entry was posted in Clutter Control, Downsizing, Home and Garden, Simple Living and tagged Cee's Fun Foto Challenge, CFFC. Bookmark the permalink. I know this feeling. I have so many books. Many were my husbands and although I got rid of a few I knew I would never read after he passed I still have a lot of them. A few months ago a friend offered to donate some vintage magazines to the Op Shop where I volunteer so I had him drop them at my house to be sorted out as the shop was short of space. Naturally, there were many that I had to buy myself. 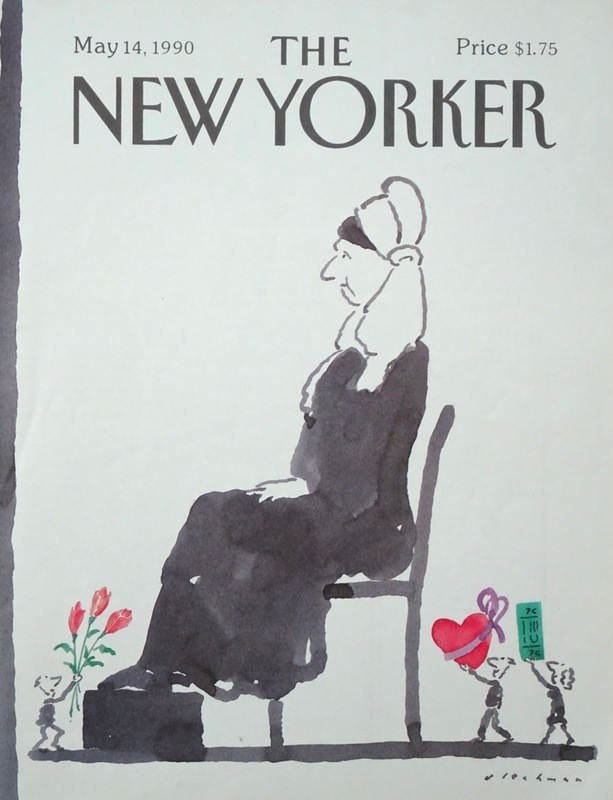 Who could resist old women’s magazines from the twenties through to the seventies? Not me. I love the ads and the older ones have beautiful graphics as there was not so much colour photography back then. Are you going to do a blog post with photos? I’d love to see it. I have done a couple already but plan to do more in the future. oh, my goodness. Magazines, yep, I have them. Although every few years I go through a stack, disposing of a portion of them. 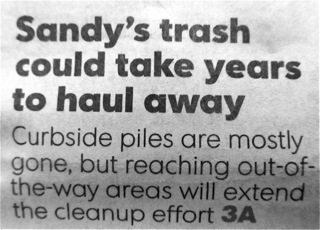 If I take them to the paper recycling bins quickly, they will be gone. I dare not start looking through them again for they might never leave. Friends say things like: “As soon as the new month’s issue comes in, out goes one from the past.” OR “I’ve read it, so it is gone.” Last year, I did go through a bunch that were related to my work life (nursing and quality management) – and since I am retired, and both nursing and quality are constantly moving ahead, I did send those magazines to the recycling bins. I’ve recycled a lot too, mainly old computer journals that the library wouldn’t take because they were too far out of date. Sometimes I leave the ones with more general interest at Dr’s offices or other waiting rooms, so they’ll get read (I hope) one more time. My local Half-Price Bookstore buys recent popular magazines for resale, but I can’t seem to part with them in time to take advantage of that. We do what we can, right? we do our best! In the past, I read several of Don Aslett’s books. His recommendation to help get rid of magazines is to go through first and remove all the advertising pages, then read the articles. Most likely the very next month’s issue will have basic same type articles so there is no need to keep the previous issue. Be careful with this – I visited my sister and without thinking used Aslett’s technique on my sister’s magazine. Oops!! She didn’t appreciate it quite as much. When I travel, I take several magazines with me. This works best for general information magazines. My crazy solution has worked for me. As I read the magazine, I tear off the pages that I’ve read (and don’t wish to keep). Airports usually have a recycling bin nearby so these are easily discarded. By the time of the magazine’s completion, I may have a few articles I wish to keep. Sometimes I decide they weren’t as important as I thought and discard the entire thing. Thanks! That sounds like just what I need. I shed the house a year ago, but I hadn’t quite finished all the sorting out, and ended up with more in storage than I should have. I was just at the storage place today, working on my strategy. I am not a keeper of magazines, but my husband sure is. He is always convinced there is something he “might want to see again.” When I recently dragged out a pile and asked him to show me what the un-pitchable article was, he was not always able to do so … or he admitted under pressure that he might be able to find that info somewhere else in the very unlikely scenario he needed it again. I did enjoy seeing your must-keeps, however, and even I might not be able to throw away that yak cover! I’m glad to have yak-sympathy! (I could also have included the one with the cute baby octopuses) Oh the curse of “might want to see again” — I’m working on clearing out my storage boxes now, so I HAVE to make myself let these go…. or, keep just one? You have exposed the absolute conundrum of this condition – keep it or chuck it! From my experience clearing out after those who keep it, I hope I chuck more than they did. But who is going to chuck the issue of Life Magazine with The Beatles featured?! Seeing the Utne Reader made me sad. I had several years’ worth, plus a nearly complete set of Whole Earth Review/Co-Evolution Quarterly stored in dad’s office when thi pipes froze, burst, and soaked them beyond recovery. Anyway, good to fine your blog.